Roxas City – Just a 45-minute plane ride from the Philippine capital Manila is the province of Capiz, located on the northeast portion of Panay Island in the Western Visayas region. It is among the top destinations for domestic travelers in the Philippines for its natural beauty and wide beaches bordering an 80-kilometer coastline. Named as the seafood capital for its rich fishing grounds, Capiz is a main contributor to the aquamarine industry in the country. Notable historical sites and old Spanish churches are a part of the distinct charm of this region. "Capiznon" refers to both the people of Capiz and the language they speak. The word "Capiznon" is derived from the word kapis, which means a marine mollusk abundant in the region used to construct traditional windows, handicrafts, and decorations. The Capizeños, as they are also known, are concentrated in the northeastern part of Panay Island whose capital is Roxas City. They speak an Austronesian language that is part of the Visayan language family and sometimes includes Waray and Aklanon words. The Capiznons' primary sources of income are fishing and farming, with rice, sugarcane, and coconut as their major agricultural products. The current population in Capiz is more than half a million people (POPCEN 2015). Modern-day Capiznons are a mixture between Chinese, Malay, and Spanish descent. The islands' early inhabitants were Aytas (locally called Ati), Indonesian descendants of the Mundo tribe in central Panay, and the Malays. Capiz is closely associated with Aklan. In fact, the two provinces were jointly called Aklan under the leadership of Datu Bankaya, one of the ten chieftains who settled in Panay during the 13th century. The province was ruled by the descendants of Datu Bankaya until the arrival of the Spaniards in 1569. The Sulod is a fascinating tribe in the interior mountains of Capiz, particularly in the municipality of Tapaz. 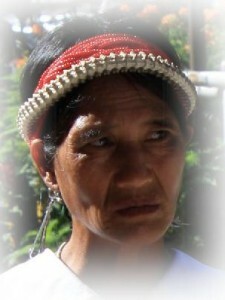 They are indigenous people generally referred to in Panay as Bukidnon. They are descendants of the Mundo tribe, an Indonesian ethnic group that migrated from Mainland Asia and lived in the mountains of Panay for centuries. Due to the derogatory connotation of the word Mundo, their tribe came to be known as the Bukidnons, then eventually as the Sulod, which literally means "closet" or “room.” They have a unique set of traditions and way of life. A unique cultural practice among the Sulod people is the keeping of binukot, beautiful women kept in closed rooms. They are forbidden from exposure to sunlight and remains in darkness from childhood until the day of their engagement. Binukot women are excellent epic chanters. A chanting can last more than thirty hours. It is in this tribe that the famous epic of Panay called "Hinilawod" came from. It is an oral folklore portraying the Sulod people as well as their sacred rites and healing rituals. It takes up to three days to share its entire story. In the olden days, the binukot women chant and dance under the moonlight to guarantee a plentiful harvest. Similar to other Philippine ethnic groups in remote areas, the lack of support and interest, as well as the tribes’ assimilation with the lowlands (especially by the younger generations) have caused the gradual disappearance of such practices from the tribe. Today, some of them have still preserved parts of their culture, such as their oral literature and language. The government has also taken measures to preserve the tribe’s traditional customs in recent years.